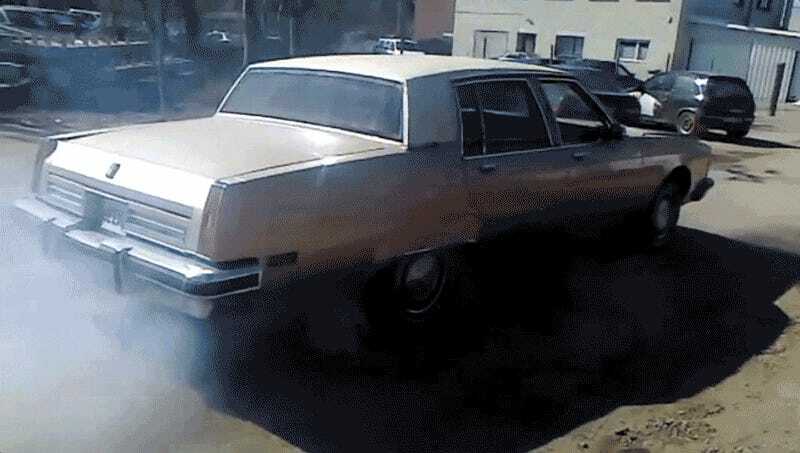 Oldsmobile diesels of the 1970s and 1980s are the subject of much derision for being noisy, slow and prone to failure. Finally, we found a good use for them: sick burnouts. This tenth generation Oldsmobile Ninety-Eight Regency’s 5.7-liter diesel is so clattery, I could swear I was listening to a truck, or maybe some farm equipment. It’s a weird disconnect from the big luxury brougham that’s making those noises. Many blame cars like this for souring American cars on diesel power for years, as General Motors’ decision to use the same head 10-bolt head design as its gasoline V8 to save costs and the lack of a water separator in the fuel system led to frequent failures, as Popular Mechanics explains in their incredibly thorough explainer on why those old Oldsmobile diesels were so bad. In fact, these engines were so bad that they convinced several states to draft early lemon laws to protect consumers from cars that came borked from the factory. But here it is: one glorious fat burnout. May this noble Olds rip glorious burnouts forever and ever, or at least until coolant sneaks into its oil. COTD: Why Did Diesel Die In The US?